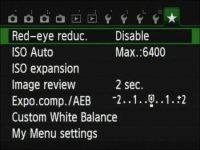 Canon does a good job of making it easy to change the most commonly used camera settings on your Rebel t5i. You can access many critical options by pressing the buttons on the camera body, and others require only a quick trip to the camera menus. To make the process even simpler, you can create your own, custom menu containing up to six items from the camera’s other menus. Logically enough, the custom menu goes by the name my Menu and is represented by the green star icon. 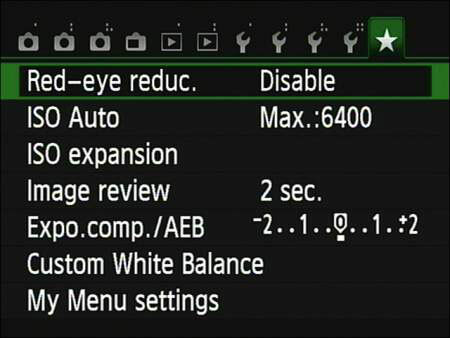 1Set the camera Mode dial to P, Tv, Av, or M.
You can create and order from the custom menu only in these exposure modes. 2Display the my Menu screen. Initially, the screen shows only a single item. To choose a menu item, either tap it or highlight it and press the Set button. 4Choose Register to my Menu. You see a scrolling list that contains every item found on the camera’s other menus. 5Choose the first item to include on your custom menu. Again, you choose the item by tapping it and then tapping Set or by highlighting it and pressing the Set button. You can scroll the menu screen by using the up/down cross keys or tapping the scroll arrows. After you choose the item, you see a confirmation screen. 6Tap OK or highlight it and press Set. You return to the list of menu options. The option you just added to your menu is dimmed in the list. Repeat preceding steps to add up to five additional items to your menu. 7Tap the Menu icon or press the Menu button. You then see the my Menu settings screen. 8Tap the Menu icon or press the Menu button again. The my Menu screen appears, with the items you added listed on the menu. Give your menu priority. You can tell the camera that you want it to automatically display your menu anytime you press the Menu button. To do so, choose my Menu Settings on the main my Menu screen. Then set the Display from my Menu option to Enable. Change the order of the list of menu items. Choose the Sort option. Choose a menu item and then tap the up/down arrows at the bottom of the screen or press the up/down cross keys to move the menu item up or down in the list. Tap the Set icon or press the Set button to glue the menu item in its new position. Tap the Menu icon or press the menu button to return to the my Menu Settings screen; press or tap Menu again to return to your custom menu. Delete menu items. Display your menu, choose my Menu Settings, and then choose Delete Item/Items. Choose the menu item that you want to delete; on the resulting confirmation screen, tap OK or highlight it and press the Set button. To remove all items from your custom menu, choose Delete All Items and then tap OK on the confirmation screen or highlight it and press the Set button.